It's like having a GPS for your relationship! THE BIG PICTURE—Get a bird’s-eye-view of what makes a marriage go sideways. Discover the way to a love that lasts. WHY BREAKUPS OCCUR—People don’t just fall out of love. Learn why some couples make it and others don’t. OVERCOME YOUR HURTS—Disappointments come to every marriage. Learn how to manage these well. STOP THE MADNESS—Dysfunction keeps relationships sideways. Break free from the Cycle of Dysfunction. THE SECRET TO CHANGE—You remain powerless as long as you wait for your partner to change. Learn the best way forward. REACH A BREAKTHROUGH—To reach a breakthrough, use the tools to resolve conflict and seek character growth. HEAL YOUR HEART—Don’t be a prisoner of pain. There’s a way back from pain to love again. Learn how to heal your heart. LEARN TO FORGIVE—People often misunderstand forgiveness. Learn what it is and how to do it well. COMMUNICATION KEYS—Learn how to express your hurts in a non-blaming way and how to defuse defensiveness. 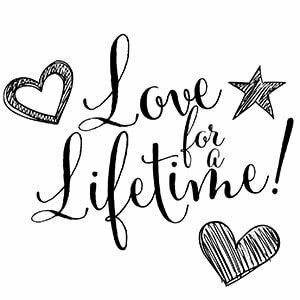 LOVE THAT LASTS—Creating a love that lasts comes from a commitment to personal growth and relational health. Build a happy home from the inside out. Learn the skills that you need to build a stronger marriage or to turn a sideways relationship around. Learn how to create a love for a lifetime. Create a Love That Lasts! Who says learning about relationships has to be boring? You’ll like the interesting and informative videos that you’ll find throughout this marriage enrichment course. The Sideways Relationships program contains dozens of explainer and animated videos. You want practical tools to improve your marriage, not just more information. 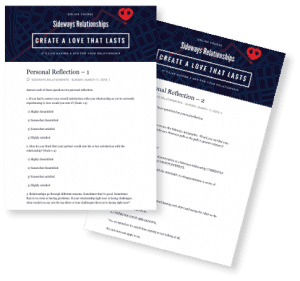 The downloadable activity pages in the Sideways Relationships online course help you to put to work the skills that you need to grow and change. And when you change, everything changes! Reclaim your power! Couples go sideways when they try changing or controlling their spouse. That’s a sure way to stay stuck and remain frustrated. By focusing on learning the skills that you need to create a healthy relationship, you will reclaim your power. The Individual Assessments following each lesson can help you to grow and build a stronger marriage. It’s like having a GPS for your relationship!